The son of Senegal's President Abdoulaye Wade has strongly denied that his father will hand him power in the style of a monarch. 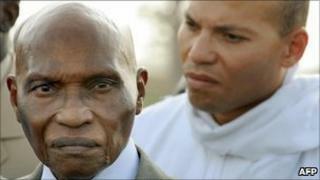 Karim Wade issued the denial after widespread speculation that his 85-year-old father was grooming him as his successor. Mr Wade has ruled Senegal for more than a decade. Last month, he was forced to drop plans to change electoral rules after riots broke out. The opposition said the changes were aimed at helping Mr Wade win elections in 2012, before handing power to his son. Karim Wade heads a "super ministry" in his father's government, which includes the transport and energy portfolios. He denied in an open letter that he intended to inherit the presidency. "I repeat and will repeat as long as is necessary - it is an insult to the Senegalese to talk of a plan for monarchic devolution. "Such a plan has not, is not, and never will be the intention of the president or myself," Karim Wade said. He said he was the victim of a hate campaign. "This confusion must be ended. This spin-doctoring must finish. This injustice must cease," he said. Last month, the president dropped proposed changes to the country's constitution after police fired tear gas and rubber bullets at thousands of protesters outside parliament. Abdoulaye Wade had wanted to reduce the proportion of votes needed to win a presidential election, and avoid a run-off, from more than 50% to 25%. He had also wanted to create an elected post of vice-president. The proposals sparked the most violent protests of Mr Wade's 11-year rule.